Join the discussion on our forums! 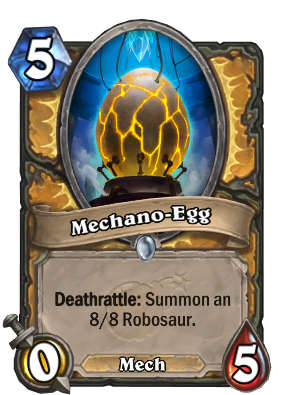 Come discuss Mechano-Egg over in our dedicated Mechano-Egg discussion topic. This might see play in Year of the Dragon. 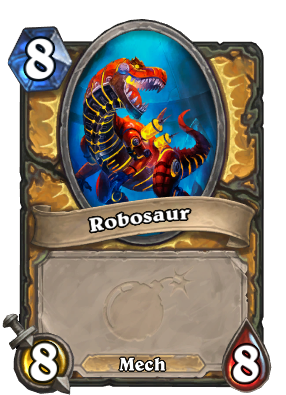 I suspect this card and Mechanical Whelp are annoying enough that they will see much greater prominence soon, considering the power-vacuum that losing KnC, KotFT, and Un'Goro will cause in Standard. I'm sorry, but I can't bring myself to like this card. If it were it were a neutral, then I could see the potential, but not for Paladin. A super sticky minion making buffs whether it be magnetic or otherwise easier to land. Not the most vunerable card to silence since it'll retain the mech tag so future magnetic cards can be applied to it as well as Sunkeeper Tarim always being a threat in minion based matchups. If they decide to clear it after a silence that means against an aggro deck they didn't hit your face so you are not dead and against control while you may be dead inside now that you super cool plan has been thwarted you have just expunged one or more of their resources so any late game card you play (The Lich King, Tirion Fordring, Lynessa Sunsorrow if you go buff heavy) has a higher chance to stick. Overall I think the card will shine in a midranged meta we just have to see if that is what the game becomes. That's one big Kinder Surprise. Blizzard: We want to make buff paladin a thing, let's give the class an egg and see what the community will do with it. me: face palm*, Really Blizzard!? with the entire expansion of buffing synergy, if Paladin can't make 1 good buff centric deck I'm gonna be quite depress. 4 mana 7/7 saw very little play, this is one extra mana and is far harder to actually achieve. I don't even think a 5 mana 8/8 with no downsides would see play. 4 mana 7/7 saw very little play? Did you play during Old Gods? It wasn't the center of shaman decks, but it was quite widely played. You must be kidding. Flamewreathed Faceless saw tons of play, and Bittertide Hydra (i.e. a 5 mana 8/8 with downsides) has seen plenty of play as well. You can easily work around the deathrattle, and if you magnetize something to it and later use Kangor's Endless Army to bring it back, you're getting tons of value. This + Spikeridged Steed may be even more annoying than [[Annoy-o-Tron]] himself. As long as there are no pesky owls around. It could be really useful if paired with strong magnetic mechs, but it is really expensive and quite slow. Also, an A tier target for a silence as well. Probably not as great as it seems but we will see. Pretty obnoxious with Bronze Gatekeeper. Then I saw the yellow borders.